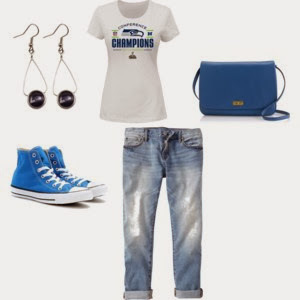 Today’s pick is the Seattle Seahawks Conference Championship tee. This t-shirt goes with just about anything. If you are in a warm place watching the game here is a sporty chic set. If you are anywhere north of Florida lol, it will make a great layer. So what are you wearing for the big game? Cute outfit! I've always wanted a pair of converse!